Thomas Roetgerman, left, gets a standing ovation after he is announced as the Minster Civic Association Citizen of the Year Saturday, Jan. 26. With him is his wife, Becky Roetgerman, both of Minster. The award was given at the Minster KofC Hall. 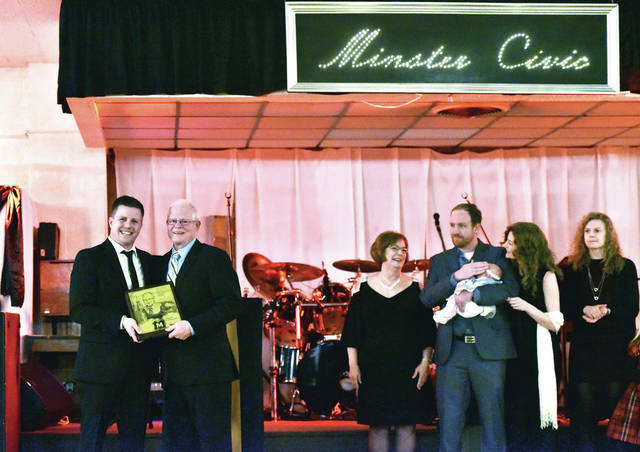 MINSTER – A retired educator was named the Minster Civic Associaiton’s Citizen of the Year. Tom Roetgerman was honored during the annual dinner held at the Minster K of C Hall. Civic Association president Tony Schmiesing said the annual award recognized an individual who went above and beyond to serve the Minster community. After being presented the award, Roetgerman said simply that the award was unexpected. “I live in a community where you do what needs to be done,” he added. His wife Becky said he was “quite a guy.” Roetgerman’s family was there with him, including his three children and grandchildren. 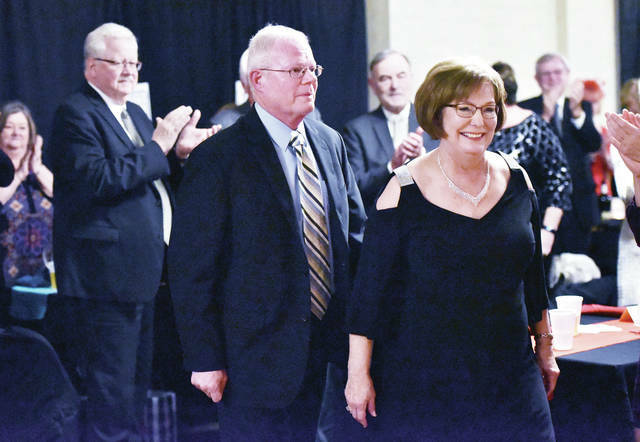 Some of the accomplishments Schmiesing said led to Roetgerman’s selection included his service with the Minster Civic Association, during which he served two terms as president. Roetgerman is credited with beginning the Civic Golf Outing in 2010, which generated 40 percent of the Civic Association’s income for 2018. In 2012 he also started the Monday Night Football Raffle, which in 2018 earned 18 percent of the association’s 2018 revenue. Roetgerman also served as a long-time member of Minster Eagles, the Knights of Columbus, and the Minster Community School Board. He was a coach for several sports, was active with St. Augustine Catholic Church, the Ohio Vocational Agricultural Teachers Association, and the FFA. 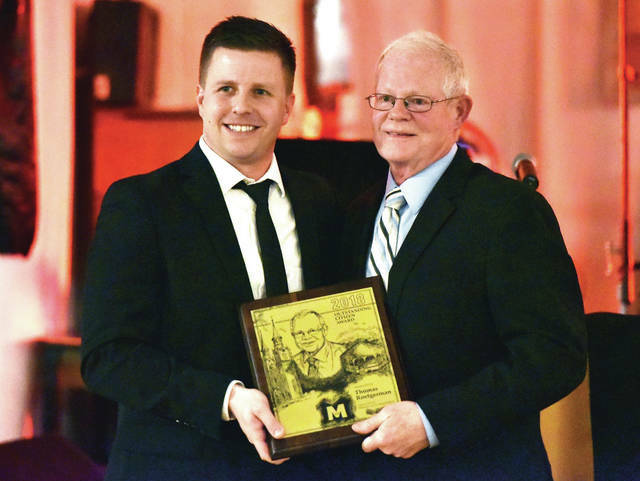 During his 30-year tenure as a vocational educator with five school districts, Roetgerman was named as the Ohio’s 1990 Outstanding Agricultural Teacher of the Year. Schmiesing, as outgoing Civic Association board president, introduced incoming President J.J.Wohrmeyer and his wife Julie, as well as the new Vice President Matt Purpus. Schmeising said the Minster Civic Association donated nearly $22,000 in 2018 to organizations which included the Minster Fire Department and EMS, Minster Historical Society, MHS Scholarship Fund and the YMCA.